The author begins by stating that you will be told how the book starts but that YOU will be the one to decide how it ends. 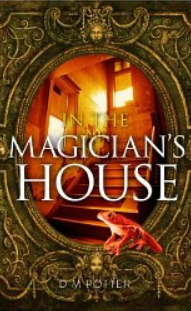 Setting for the reader is a magician’s house where you live and work. There is always a mystery as you explore its rooms.. The reader might be asked to find things or go to places in the house. Dreams are always lurking, and you might be transported to places outside the house. In short, one never knows what will happen or where you might end up. A scenario is painted for you and you must choose your destiny. Most days you would start by eating breakfast, but finding the kitchen is not always simple. On the first morning, the reader wakes up in his turret in the tower of the house. When you feel something cold on your face, it turns out to be a frog. You get dressed in the dark and hope the stairway will lead to the kitchen. This morning you have found a corridor that stretches to the left and right. On the left you find a suit of armor, to the right there is a hole in the floor with a ladder sticking up from it. Now you must make your first choice! Depending on your decision, you will continue to stop and investigate or remain on the path that you currently pursuing. Throughout the book the reader has numerous choices and paths to follow. You might find yourself in a classroom, a tenement, or meet a character in history. Will you succeed and find Mrs. Noogles, the cook, making your breakfast or perhaps find yourself in another part of the house or even some other place? If you don’t like your choice the first time, you can always go back and start again. This book of nearly one hundred pages provides lots of entertainment and adventure for readers age nine and above. Because of the diversity of outcomes, a child will want to reread and revisit it over and over again. Boys and girls in the middle grades will particularly like the element of being in control over the outcome, but I would venture to say many parents and adults will enjoy reading it as well. Highly recommended book for lovers of magic or adventure. PIRATE TRIPLE PLAY Book Review March 31, 2013 HAPPY EASTER! This book actually consists of three separate adventure stories. Each of the books is set up as a chapter book. There is a lot of colorful, pirate language especially in the first book of the trilogy. Many children will love this feature even though it will make independent reading of the book more difficult. 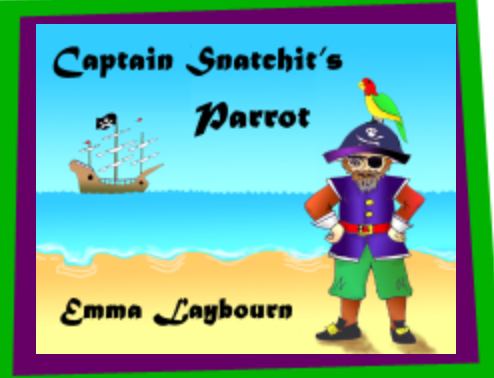 In the first book, which is titled The Pirate’s Parrot, we meet Neptune, Captain Snatchit’s mistreated parrot. When the ship is attacked, the pirates man the life boats and Neptune is cast off on his own. Just when he is at the point of exhaustion, Neptune spies an island which is inhabited by parrots and monkeys. He settles into a normal life with friends and fun. But soon after a ship is spied on the horizon and the parrots will have to find a way to dispose of the pirates. In the second story called Captain Snatchit’s Revenge, the captain realizes he has been outwitted and finds a way to get back to the island by hijacking a fishing boat. The crafty parrots must again find a way to trick the pirates and sink their ship. The fishermen suffer the loss of their fishing boat, but the parrots are sure they are rid of those pirates for good this time! Book Three is named The Wreck of the Seahag. The pirates return with a salvage ship ready to raise the Seaslug. Neptune realizes that Captain Snatchit will not give up. He despairs but Liana urges him on implying that they are smarter and can outwit him. All the inhabitants of the island work together to come up with a clever scheme to defeat the pirates. Will they finally succeed in their mission and regain their peaceful home? The book is an adventure filled with moral lessons. Underlying the story are lessons like the value of team work and cooperation, the need to be honest, truthful, and courageous, the need to be strong, and not give in to your weaknesses. The structure of the story allows the reader to stop at the end of each book or read it in one sitting. 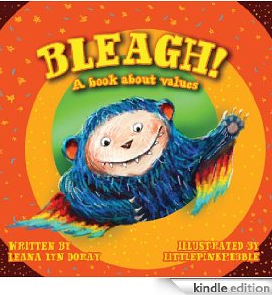 It is suitable for a read aloud or can be developed into a series of classroom discussions. I recommend it as independent reading for ages five and six. Younger children will enjoy the simple pictures and the story when accompanied by the explanations of parent or teacher. As a bonus, you may visit the author’s website http://megamousebooks.com/puzzlepageslist.html to download a free pirate crossword puzzle! Available at http://freekidsbooks.org/ for download, printing or as an e reader.